Some friends recently went to exactly where we're going in Swaziland (we'll spend most of our time at the Gege CarePoint). Over the next few days I'll repost here, with permission, Glenn Packiam's thoughts on his experience. To read all four posts at once, you can go to Glenn's blog. To read more about our family going and different ways that you can help us get there, go here. Part Two: "More Than a Face on the Fridge"
When the children began arriving at the CarePoint, we all stopped. What beautiful faces. Many had come from school, ready to eat. The CarePoint at the Gege community can only afford to feed these children three meals a week at the moment, so the meals are as filling as possible: rice and beans or a corn flour mash ("pop", they call it) with beans. The children ate with grateful haste. Then we sang with them. Rebecca Jackson, one of our team members, had written a simple kids song the night before that quickly became a favorite. Then it was on to an hour or so of games for the boys-- soccer!-- and crafts for the girls. Each afternoon at our two "sponsored" CarePoints were like this. Songs and a Bible lesson, then face paint and dance parties and soccer games and Captain Ball. Our team did an amazing job not only in organizing and leading these activities, but in being present and attentive to the children. I watched Matt Howard, a mechanical engineer, jump around like a monkey, getting the children to chase him; I saw Sarah Rieves find the quiet child who kept to himself and sit him on her lap; I saw Alyssa Gordon holding the little ones; I saw Jason Pederson, an architect, make stories out of the "Jesus Storybook Bible" come to life in front of the children; I heard Rebecca Jackson narrate the whole story of Salvation from Adam to Jesus with clarity and simplicity and love; I watched Jenn Randolph lead a hundred children in dance moves with a felt cut-out teddy bear; I saw Chris Burley paint faces for an hour and give a word of hope to a widow. One of our team members, Jennifer Randolph, a dance teacher and our children's director for NewLifeDowntown, said to me that first day, "Children are just children, all over the world." I had been thinking the same thing. From our first day at Gege, I kept looking at the faces of the children, imagining my own 7-year old and 5-year old girls, my 2-year old son. What if this were them? These children did not choose to be born here, to parents with HIV or some other disease that ended their lives early. Watching them laugh and play and sing made you realize the hope we associate with children: maybe life will be different for them. Maybe we can, in some small way, help. On our second day at Gege, I met the boy that we sponsor. Mbageni. He was quiet and shy, but smiling. He told me his age and what grade he was in in school. The conversation-- if you call call it that through broken English-- lasted all of 3 minutes. But when it was over, I was a wreck. I had seen that face on our fridge a dozen times. We were happy to help his community by sponsoring him. But there was no way to prepare for this. Seeing his face, his smile, hearing his voice, knowing now what he ate-- as a luxury!-- three times a week, having visited homes that may be like the one where he stays....there was no way to prepare for that. I had to walk off for a few minutes. Tears began streaming down my face. The only prayer I could manage was, "Thank you, God." Not "thank you" for what we have; but "thank you" for letting me share in Your work. Thank you, God, for letting me see this boy, for allowing us to shine Your love, for bringing a small thread of hope to his life through us. These children are more than a face on the fridge. They have names. And stories and fears and hidden dreams. They are like children everywhere. They don't think about the future because children live in the moment. Parents are supposed to think about a child's future, but many of these children have none. But that does not mean they are forgotten. The Lord sees them. The Lord knows their names. And now, through the work of these local pastors and Children's Hope Chest, through the churches in America who "sponsor" these communities as a whole, and these children in particular, they have something new: hope. 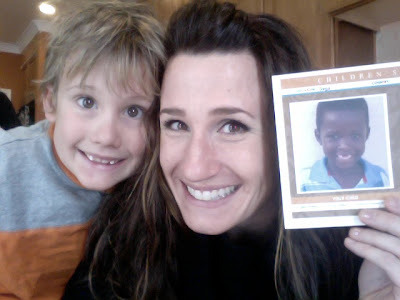 Note from Angela: We had our children read Glenn's post on his Swazi experience. When my eleven-year-old daughter, Brittney, finished reading she just sat quietly at the kitchen table for a few minutes. "Mom? So, we get 3 meals a day plus snacks, and these kids only get 3 meals a week?" "Yes. A few of them may have other food to eat sometimes, but for the majority the only meals they get are the ones from the carepoint." "So, our Tebo may only get 3 meals a week? But, he would get more if people from church would sponsor these kids?" Her eyes filled with tears. So did mine. We have committed to this community. We have work to do.